If you would like to receive a copy of our terms and conditions, please contact us. These terms and conditions apply to all of our professional cleaning services booked on line. We have the right to alter any items with it and it shall supersede prior agreement with exception to existing and active contracts. Regardless of how you hire us; phone, online, fax, or actual physical negotiation, all contracts are subjected to these terms and conditions. We are willing to help our customers on all types of cleaning jobs at a minimum price of £14.00 per hour without VAT provided that you will engage us for a minimum of 3 hours of cleaning services per week. The cleaning company have the right to deduct commission charges on advance contracts computed with inclusion on factors such as weekly schedules or hours as the contract is still active. However, should there be termination of contract; the commission is still deducted provided that advance payment is made. Should this commission not be included; advance notice of termination is required for cancellation of services. It is mandatory for the client to inspect the services performed. It is the client’s responsibility to notify us within the 24 hours prescribed period, if they are disappointed with the services. In case of late notification, the company has the right to determine if the reasons are logical or not and the client should present evidence for as such. If there are complaints for a dissatisfied service, the client should allow our company to send back cleaners to do back jobs; otherwise, we shall not issue refund if the client will not allow us to complete the work. During the booking process of different cleaning services, the client is obligated to provide the required information whether through phone or email such as personal and professional profile and other payment details. As soon as we received all these, we shall send a confirmation online communication to the client a day before the work will be consummated. Exception is applied should the client cancel the service before the cleaning operation will start. It is the responsibility of the client to remove and store fragile and breakable items. In addition, the client should give access to hot water, electricity, and other relevant household items necessary to deliver cleaning services. The company and the cleaners are fully insured as such we are able to pay all liabilities involved when it comes to damages provided that we duly notified. As a rule, we shall provide the normal cleaning tools and equipment necessary to deliver our cleaning mission. However, in cases that there are special methods and tools needed, we shall indicate it the work plan we have presented to you prior to consummation of the services you contracted with us. With regard to carpet cleaning, our company is not responsible for any permanent damage to your carpet prior to your engagement with us. Rest assured that this will be clarified before we start with our services. End of tenancy cleaning conditions are limited to what the contract and the client has signed. Should there be inclusions such as cleaning of walls, windows, carpets, upholstery, patios, balconies, and other relevant areas not included in end of tenancy cleaning contracts, we shall gladly provide you with relevant cleaning services at special price, offers, and deals. Please do not forget that the property should remain unoccupied. We reserve the right to demand 50% of the total cleaning contract. Should there be a cancellation, we require 48 hours notice for you to do so. Otherwise, we are not obligated to provide for a refund and we have the right to keep advanced payment should you fail to advise us within the prescribed time allotted for you. It is mandatory to inspect the results once cleaning operation is consummated and provide details of complaint if and when they are not satisfied. 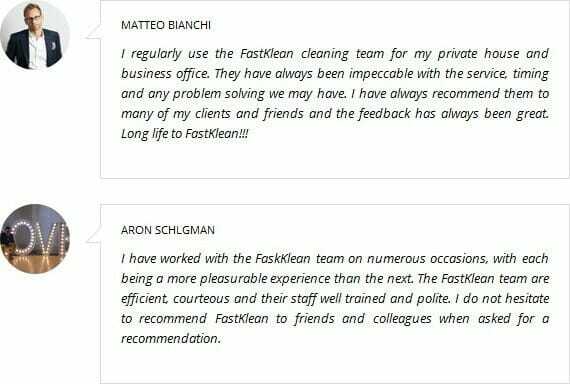 If and when, the client is still not satisfied with the back job operation, FastKlean should be notified, otherwise, all claims shall be forfeited. We demand that balance of payment shall be deposited once the client is satisfied after all the cleaning services are completed. In accordance with legal advice obtained, you are strictly warned to refrain from placing any negative reviews on any social networking sites in the public forum, alternatively we will have no choice but to also pass the matter to our solicitors in regards to pursuing the issue of defamation. We trust that we have made our position abundantly clear and reserve the right to recover any interest accrued and legal costs if necessary. It is always our desire to satisfy our customer. In order for us to do so, it is imperative that you are familiar with our terms and conditions. Otherwise, it is always a source for disagreements and discussions. We would like to remind you that all phone conversations are recorded. This is for the benefit of fastklean.co.uk and our clients. As added confidence, we will assure you that all our activities are documented for you to review. This is to ensure transparency of services provided. Get in Touch with FastKlean!